From Glasgow’s role in the slave trade to ending the US embargo against Cuba, here are this week’s top picks in imperial and global history. “People are starting to think about Glasgow’s colonial past in a new way, and it can only be described as a cultural awakening. It is historians as well as academics, there’s a new historiographical understanding,” says the author of the acclaimed book, It Wisnae Us! The Truth About Glasgow and Slavery. Carols echoed through the Christkindmarkt in Vienna on the morning of December 21, 1975. The sky was overcast, and trees stood leafless in the neighboring parks. The edelweiss flowers adorning many of the stalls and shop windows were past their bloom, and their petals and leaves had begun to crumble. Manuel Noriega, the former dictator of Panama, is in the news after deciding to sue the video-game publisher Activision for using his likeness in Call of Duty: Black Ops IIwithout permission. The eighty-year-old Noriega, who is serving a twenty-year prison sentence in Panama for human rights abuses, is seeking payment of the ‘lost profits’ he feels owed. Hillary Clinton made a case Thursday for lifting the embargo on Cuba, describing it as “Castro’s best friend” and signaling she does not fear any potential political backlash in Florida by suggesting the U.S. normalize relations with the island nation. In an appearance in New York hosted by the Council on Foreign Relations, the former secretary of state said, “I think we should advocate for the end of the embargo. 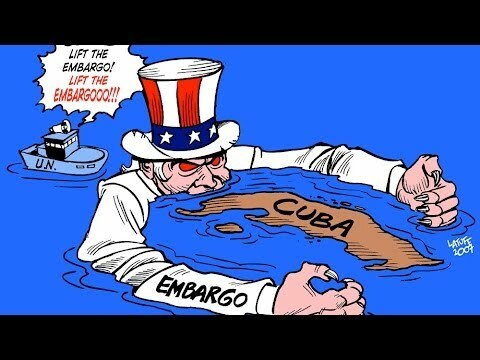 We should advocate for normalizing relations and see what they (Cuban officials) do.” […] The economic embargo against Cuba has been in place for more than a half-century. Over that period, major presidential candidates have tread carefully in discussing the embargo for fear of alienating voters in the voter-rich swing state of Florida.